Holy November! I've been trying to get Halloween down today, and recover from the weekend. We had a fabulous Halloween, and am ready to move on to Thanksgiving, Christmas, and a new baby at the beginning of the year! I loved your ideas about the table legs~I was seriously just going to chuck them, but with all of the suggestions, how can I throw them away?? I will keep you posted if I do anything with them, but right now, my project list is getting a little out of hand. 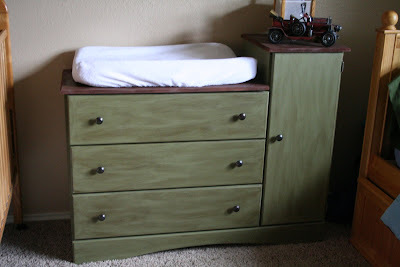 The dresser I got at a yard sale when we lived in Idaho~ it was a standard whitewashed color, but it's heavy and solid, and I love the shape of it for a changing pad and storage, so I just painted it the same green as the letters: Laura Ashley Olive 5. Did a brown glaze over it, and spray painted the top brown. 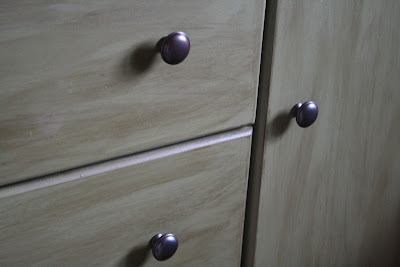 the brown knobs were at Target for $2.12 a piece~they have some really cute knobs there in the hardware section! So, room by room we've been priming and painting them and adding a brushed nickel handle. 3 more down! Remember the little black lantern lamp from my yard sale finds for $1?? 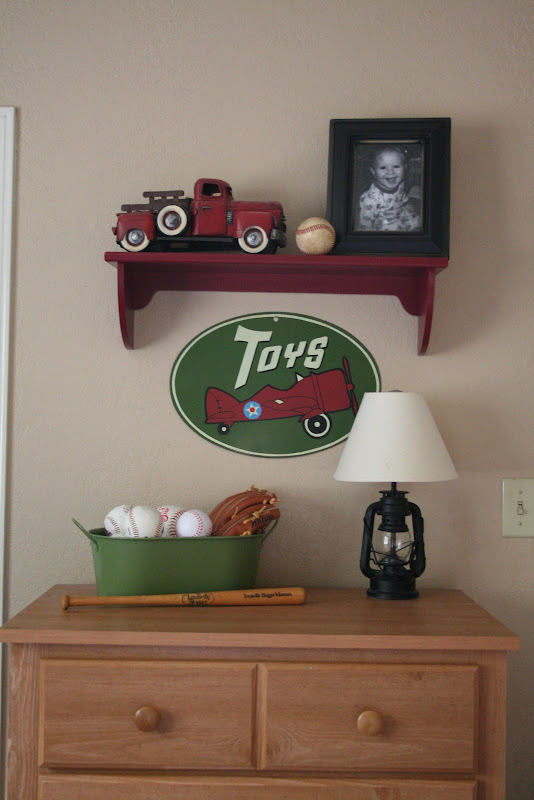 The red truck is from my mom, the toys sign was from a yard sale in Idaho, the tin holding the baseballs and mitt is from the Target dollar spot (not a dollar though, $2.50), the baseballs are all from games or yard sales, and the bat is from the Louisville Slugger museum in Louisville! I love it! 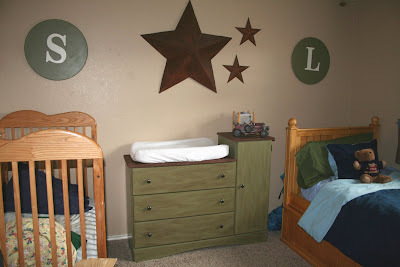 I need to finish my little boy's room so I can post photos. Wow! What a great job you did on your boys room! Don't you just love Target clearance?!! I love cruising the back end caps looking for deals! Have a great Monday! Okay, you are like my new Martha Stewart. I love your ideas! Your boys room turned out so perfect. What kind of glaze did you do on the dresser? Do you buy it or just use a stain? P.S. The letter/circle signs are so, so adorable! I think I might do one with an H for our last name and put it in our living room. Wow! That looks great! 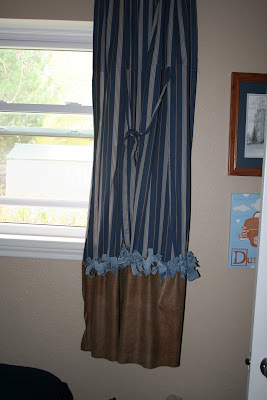 Good job on the curtains...love the 'fringe'. I love how all the greens match so well, even all the pieces purchased at different times/places. Great job! You are SO talented! I love your boys room. So Pottery Barn looking! I am wishing there were some garage sales in my area this time of year. okay this is so cute I love everything you did a great job! The room looks great and I love that everything is budget friendly!! 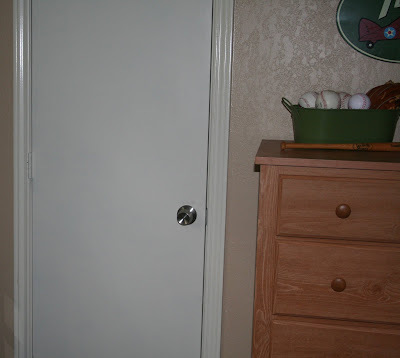 Since you painted the door and trim, what color is the rest of the trim in the room? I've always wanted to do that but didn't want to have to paint all the trim in the whole house! What a cute room. I really love the green mixed in! Great room for your little men! Love the vintage accents! Really great decorations! Makes me want to re do my boys room. oh how I wish we were still neighbors so I could hire you for some professional "thrifty" decorating!! the room is absolutely adorable and sooooo boy! love it! so classy! The boys room looks wonderful! I love the color scheme and how everything flows together so nicely. I also love that you made the ragamuffin border out of used jeans! What's the saying? Frugality breeds creativity or something along those lines. The bedroom looks great. Awesome job :) My sister is also expecting at the beginning of next year. What a way to start out the year!! AJ~This house has weird trim schemes. 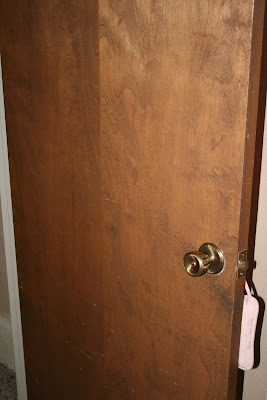 In all the bedrooms, they used the white trim, but then put brown doors in. In the main living areas, they used stained wood trim, so that's what we've had so much fun painting. We just color matched the white trim at Home Depot and have been slowly painting everything to match. Hope this helps! Holy Smokes. . .we've lived in our home for 18 months- or more? and I still haven't decorated ANY bedrooms! Oh well! You are on it lady! 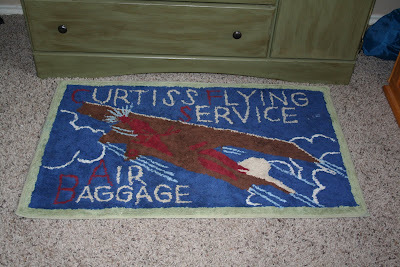 I am pretty sure I have this Airplane stuff from Target from when my son was little. 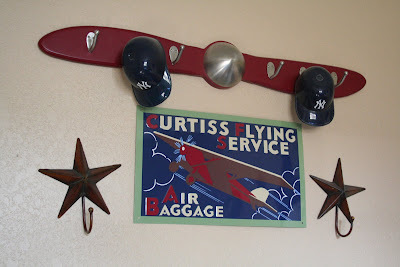 If you are interested in any of it let me know...I think I have blu airplane wall hooks and some bedding...but I could not find your email address. Aha, I knew if I looked well enough I could find more pics of that room! ;) This is an awesome boy's room!! All the details are super cute too. My favorite is the colors you chose. My son's room has that red shelf and the wings. They were originally sold at Target. The wings were $25 and each shelf was $15. You got a good deal.